Mother’s Day is a perfect time to celebrate your mother and let her know how appreciated she is for all that she has done for you. Why not make your personalized printable mother’s day cards to celebrate the most special moment? 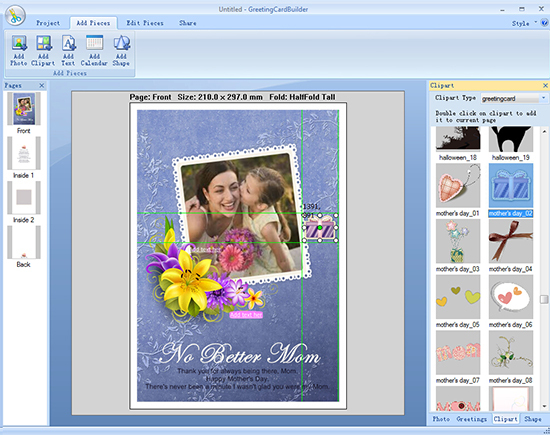 Greeting Card Builder is absolutely an easy-to-use card maker that helps you make the greatest mother’s day cards to let your mother know how much she means to you and how much love you have for her. 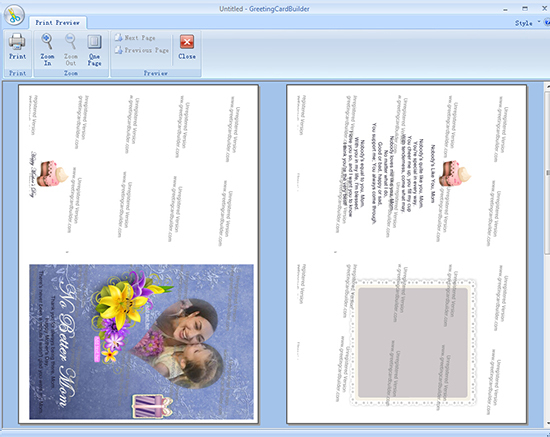 Below are some steps on how to make printable mother’s day cards. Open Greeting Card Builder and click Create From Template pane. 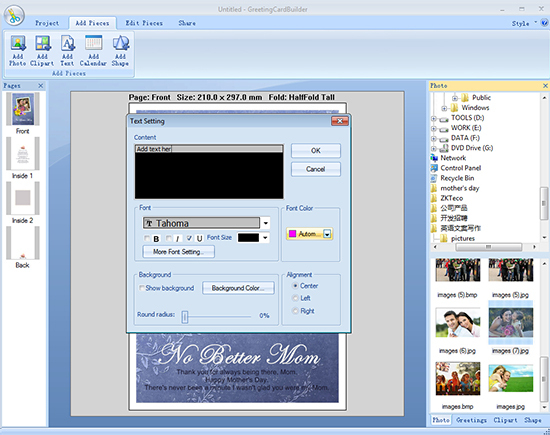 Choose one your favorite mother’s day template and change its size freely by clicking Change Template Size pane. 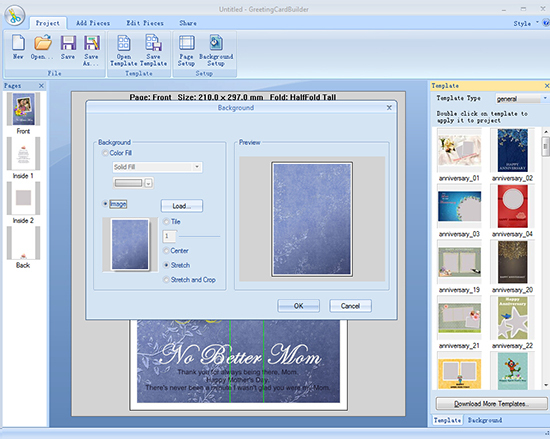 Click Add Pieces → Add Photo pane on top of window to add your mother’s photos to the edit area. Free to resize photos by dragging your mouse. Free to add more embellishments, such as text, background, clipart, mask, etc. to make your mother’s day cards more beautiful. Click Add Pieces → Add Text pane to add words you most want to say. You are free to set font size and color based on your own needs. 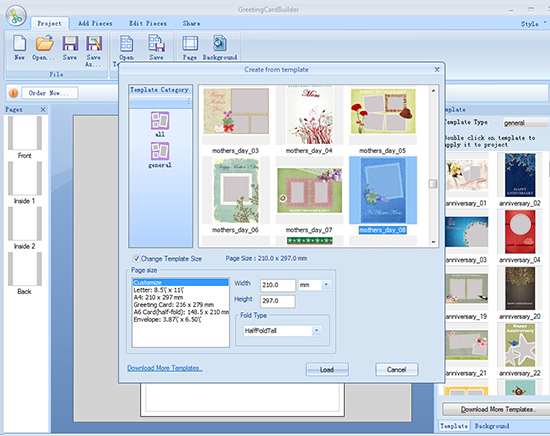 Click Project → Background Setup pane on top of window and set your background by clicking Color Fill or Image. You can preview it on the right until it gets your last satisfaction. 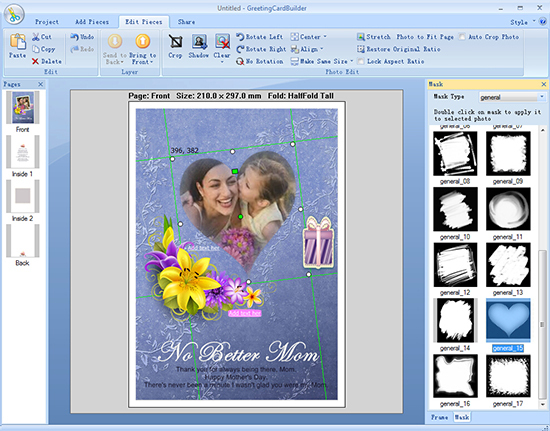 Click Add Pieces → Add Clipart and choose one loved mother’s day clipart to add it to current page. Free to change its size to fit the edit area. Click Edit Pieces pane on top of window and click Mask pane on the right bottom. Next choose one Mask Type you like and select one photo to apply by double clicking. 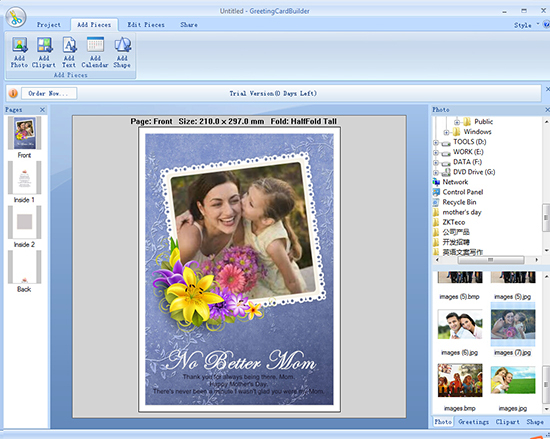 Click Share → Print pane on top of window to print your Mother’s Day card directly. 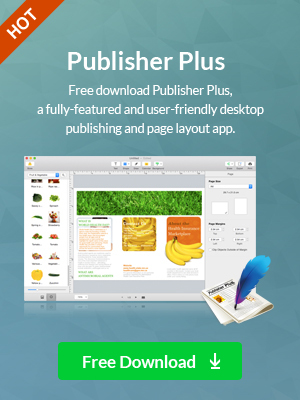 You can preview your work first and then print it out if you feel satisfied. These four steps can easily teach you how to make unique printable mother’s day cards to express your heartfelt thanks and deep appreciation to your mother.